Gold prices ended the day unchanged after failing to hold gains above the $1200 level. After peaking at $1206.65 per ounce, the price moved back towards the $1196 level due to a sharp decline in US equities and a move to the upside of the US Dollar especially against emerging market currencies. 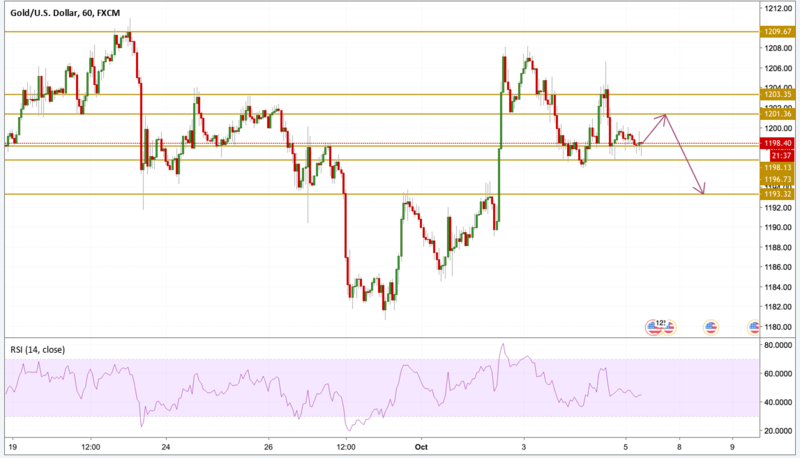 Today's NFP report will have a crucial impact on the future of Gold prices as it may define whether it breaks above or below the range it is trading in for the last couple of days. A volatile day for Gold prices as they were initially higher reaching the $1206 level before ending the day below the $1200 level. There's severe selling pressure when prices reach the 1204 level forcing Gold to trade in a tighter range than before, however, we expect a light push higher before prices trend lower again and then we will be focusing on the $1193.3 support level.